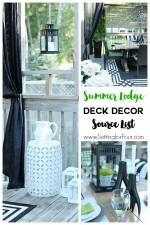 See tons of DREAMY Beach Style Decorating Ideas for your home in my summer home tour. 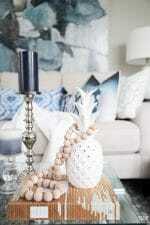 A coastal home tour with lots of rooms decorated in beautiful coastal palettes and beachy accents to grab ideas from! Hello friends! I have a big treat for you today! 16 bloggers including myself are opening our homes in a mega waterside house tour – to share with you our beach style decorating ideas, coastal and lakeside living ideas! We are sharing with you just how much waterside living is infused into our souls! In these 16 gorgeous waterside home tours there is a TON of beautiful decorating inspiration for you – that you can duplicate and add to your own home! But first off I have to be completely honest here and fill you in….I currently don’t live near the water!!!! 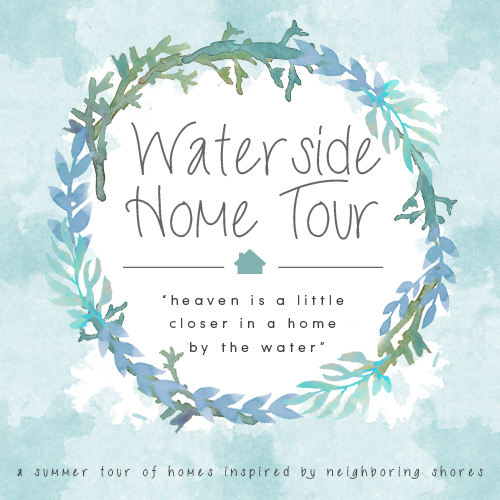 So why in the heck am I part of this waterside home tour? I received an email from a new friend of mine and fellow blogger Emily at Table & Hearth and our conversation went something like this…. It sounded exciting and I was flattered to be invited! Then I told her we had something fun in common- our love for biology! I used to be a Research and Development microbiologist back in the day and Emily is a biologist! Instant kinship! 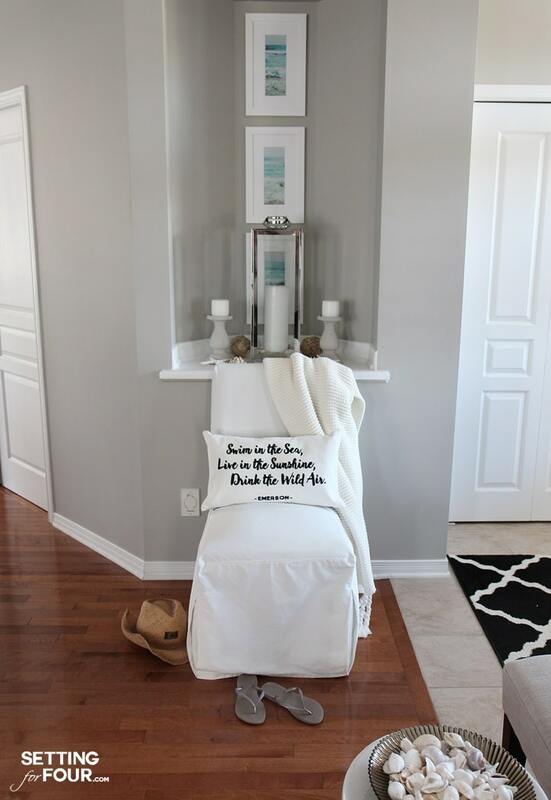 Emily invited me to join in anyway and share my love for the water and my beach styled home decor ideas- yay ! I grew up on Lake Erie and spent every summer as a young girl playing on a beautiful white sandy beach, chasing minnows in the shallows and burying my body up to my neck in the blazing hot sand…then later as a teen working on the beach in my Mom’s beach side restaurant, swimming every second I could and diving fearlessly off the fishing pier! Later on I met the man of my dreams, an infantryman and our many military moves took us to adventures and postings where we lived near water – ironically my hubby is in the Army not Navy! 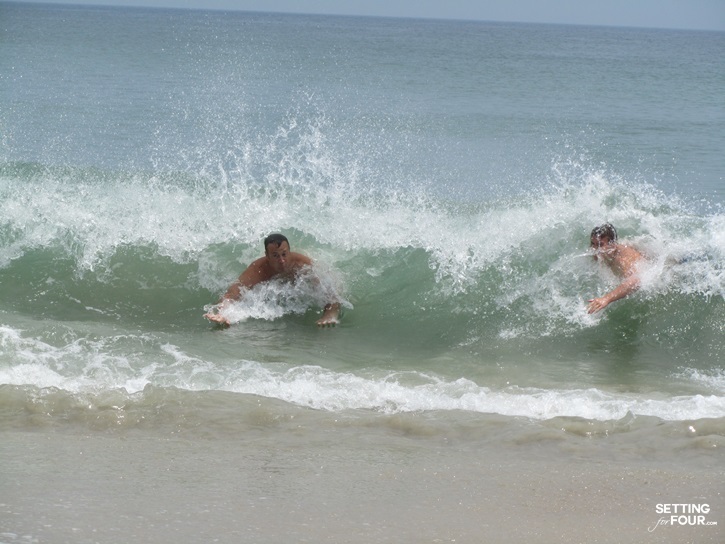 Body surfing in the ocean – that’s my handsome hubby and our oldest boy! Posting # 2 took us to Lake Ontario and postings #4 and #6 took us to the banks of a huge northern fresh water river. 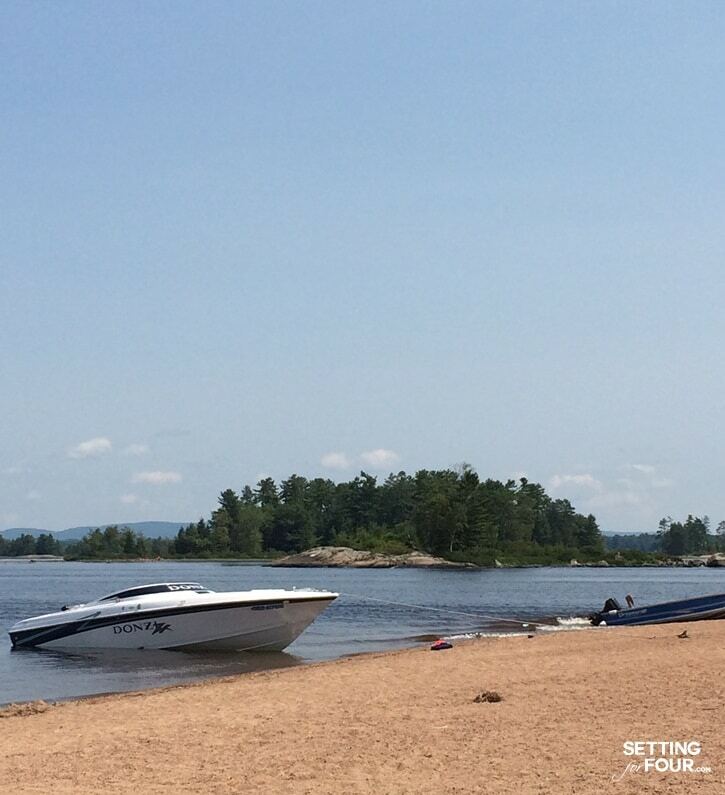 It was like a big lake, where we used to boat, water ski and tube – it was so much fun! Wherever we live we always find the nearest beach! We love the water so much that my hubby and I are also PADI qualified scuba divers – here’s a barrier reef in Belize that we’ve dove at! 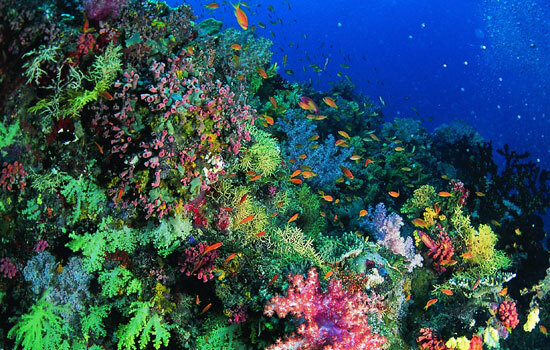 Scuba diving gives you a glimpse of a whole new stunning, watery world! So there in a nutshell is how waterside living and waterside playing has captivated our family! While we don’t live near a body of water right now I love to surround myself with all the beautiful memories that water has given myself and our family. 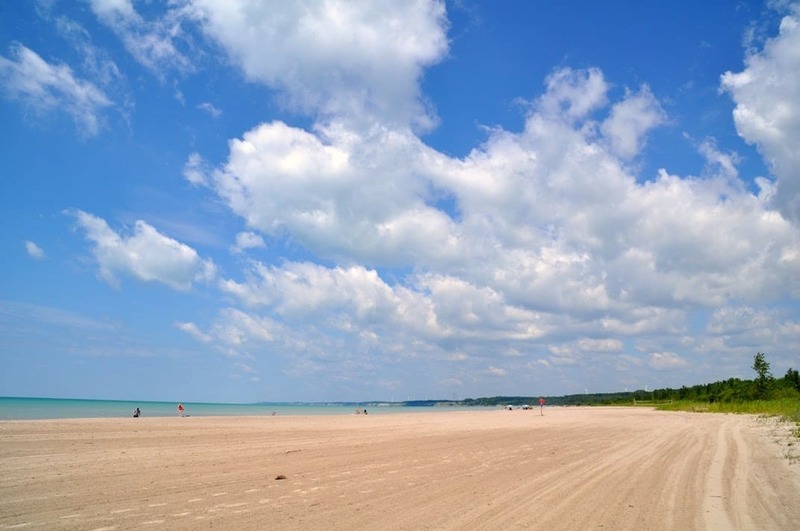 ….And here’s my beachy, wish-I-was-still-living-by-the-water, summer home tour and beach style decorating ideas! 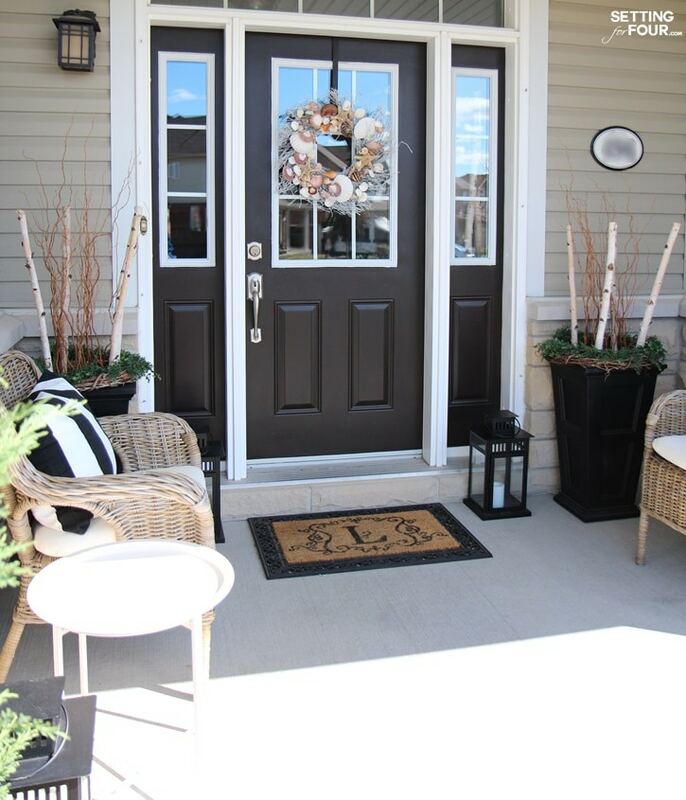 I love decorating our front porch for summer! Candle filled lanterns, big urns filled with curly willow and birch, a big shell wreath and driftwood colored wicker chairs to sit on and watch the sun set! 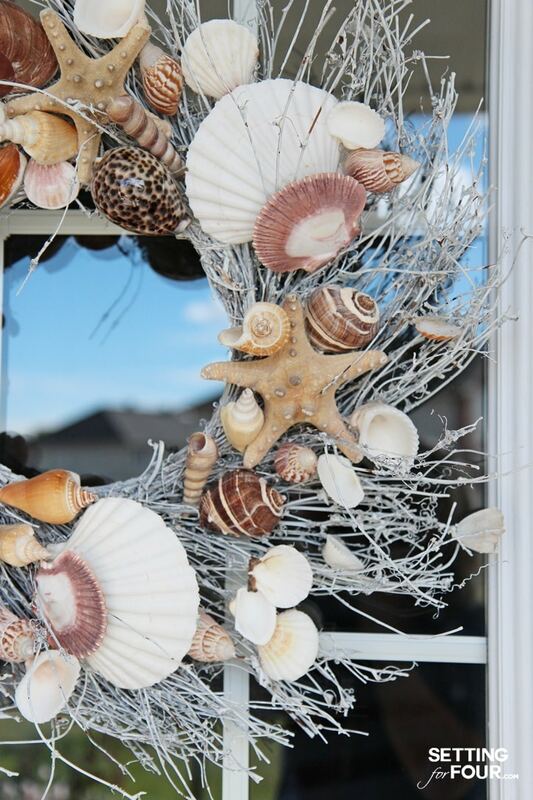 I have a huge shell collection and my front door is the first place I love to decorate with them! 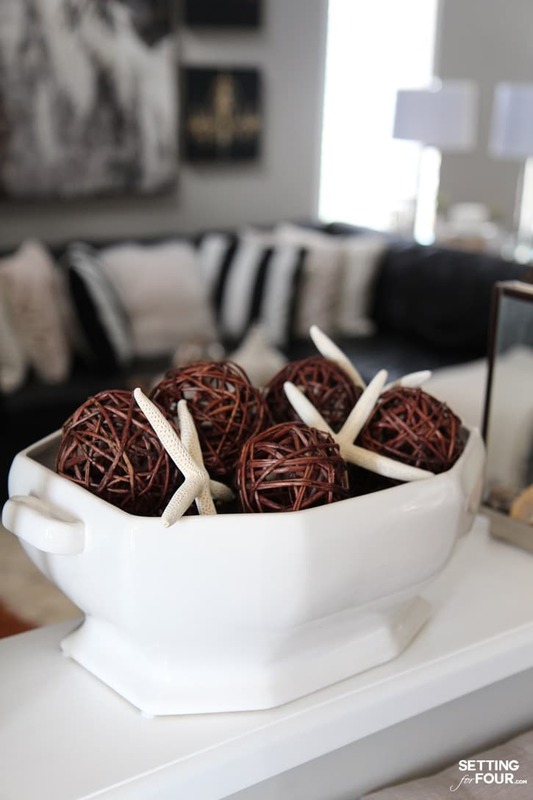 I added a big ironstone bowl filled with starfish, lanterns filled with shells from the gorgeous Murrells Inlet beaches in South Carolina…. 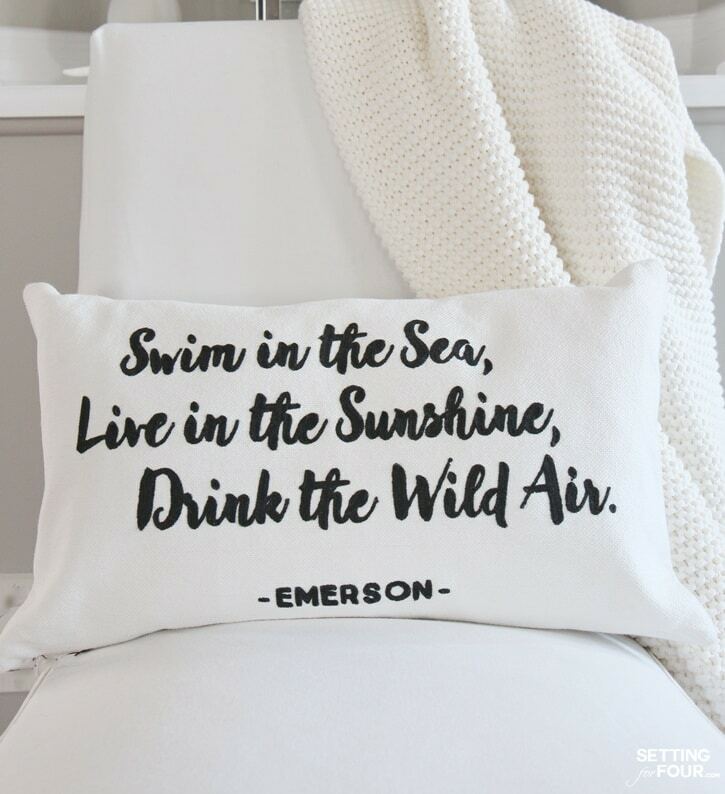 and pillows in a ocean and sand hue tones. I love collecting ironstone do you? 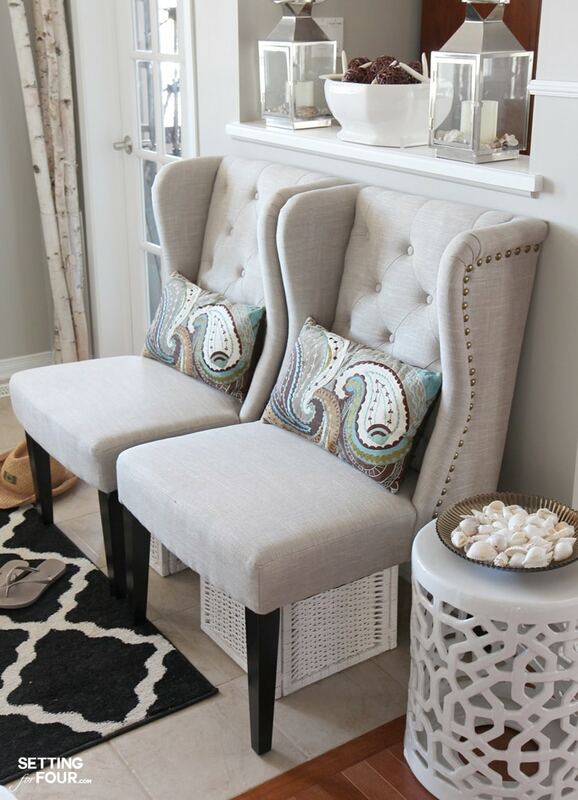 We have two wall niches and I have to admit – they aren’t easy to decorate! I hung 3 narrow beachy pictures and added a big silver lantern filled with more shells, candlesticks and rope balls. See all of my paint colors here! We’ve had this black sectional couch forever and it’s so comfy! We love to pile on it for family movie nights. Pillows with a nautical rope image, rope in vases and lots of creamy whites are the simple beachy ways I decorate this room for summer. 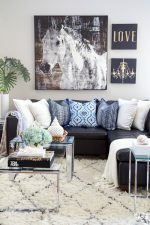 The star of our family room is our abstract horse art! I used to ride as a young girl and LOVE horses! This white and grey horse reminds me of the trip we took to see the Corolla wild horses that live in the Outer Banks, North Carolina! Have you seen these beautiful wild horses? They’re descendants of Spanish mustangs that were brought to the US by European explorers…. and have been isolated from man for the most part for nearly 400 years. 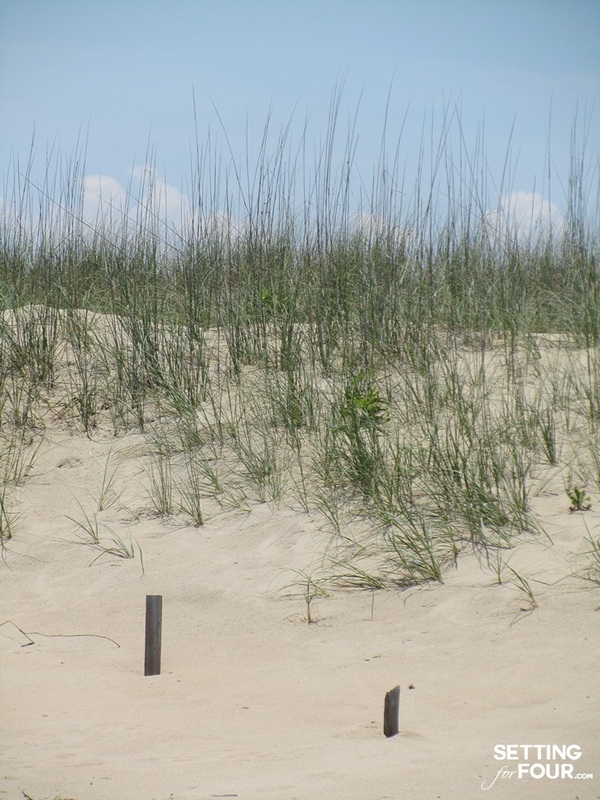 They live right on the beach and roam 12,000 acres of protected Carolina coast. 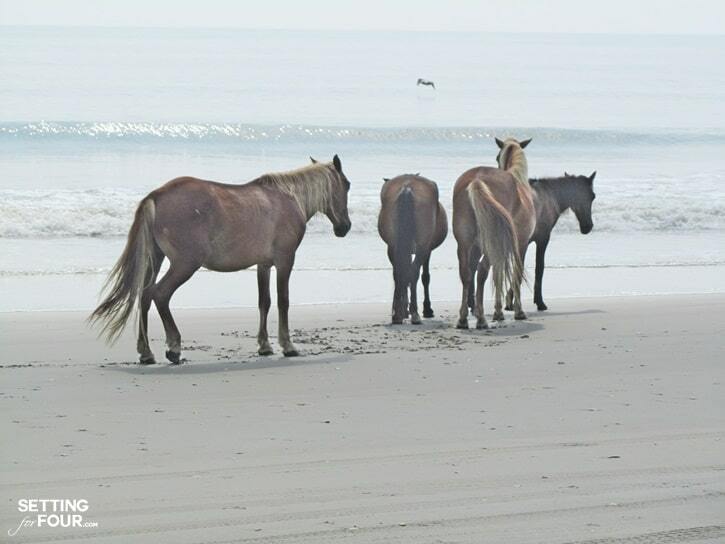 We saw them a few years ago when we lived in Virginia and went on a fun Humvee wild horse beach tour to see them in their natural habitat. Our boys loved it! 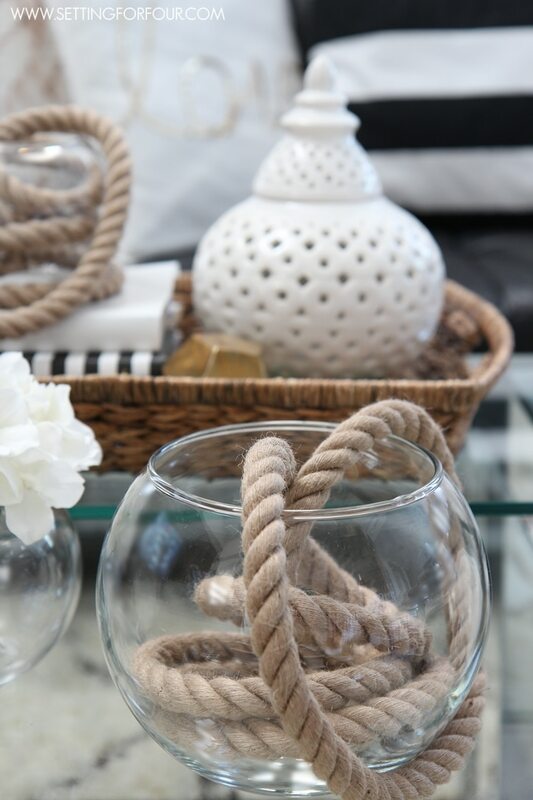 Here’s a quick and easy Beach Style Decorating Idea – add some rope into a clear fishbowl style vase to decorate your coffee table. This reminds me of the rope that fishermen used to tie down their big boats that fished perch, walleye and rainbow trout on the lake I grew up on. 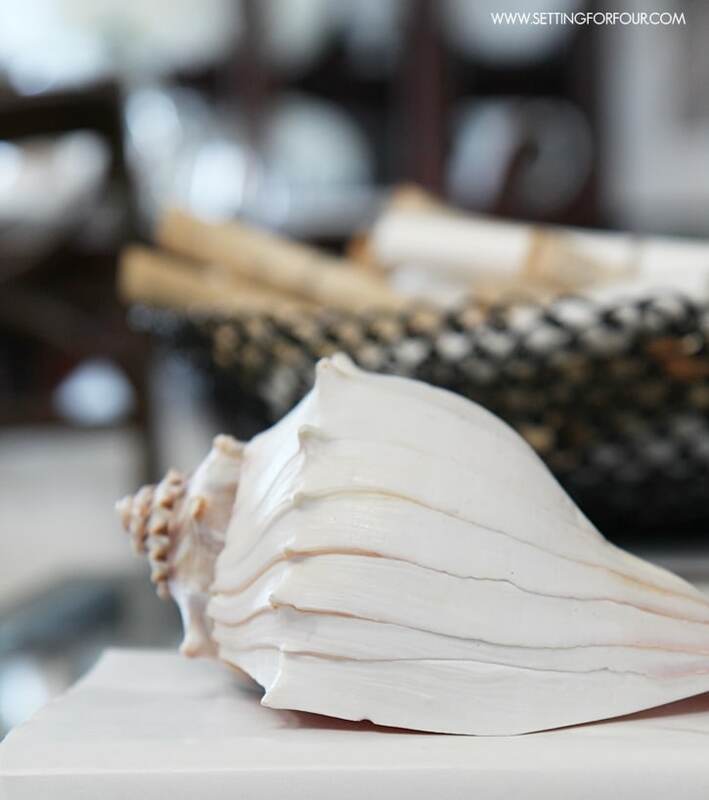 A simple shell on a stack of books is another easy coastal decorating idea. We love family movie nights! 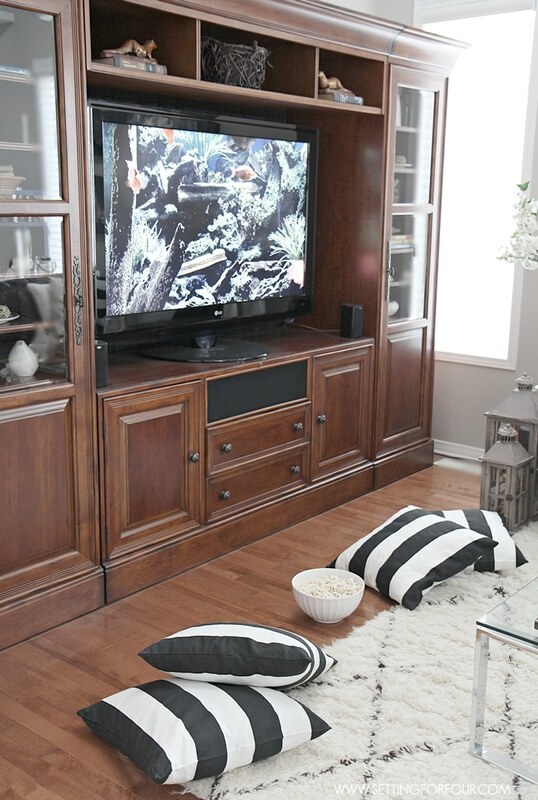 This is where we hang out watching movies on our big screen TV – popcorn is a must! 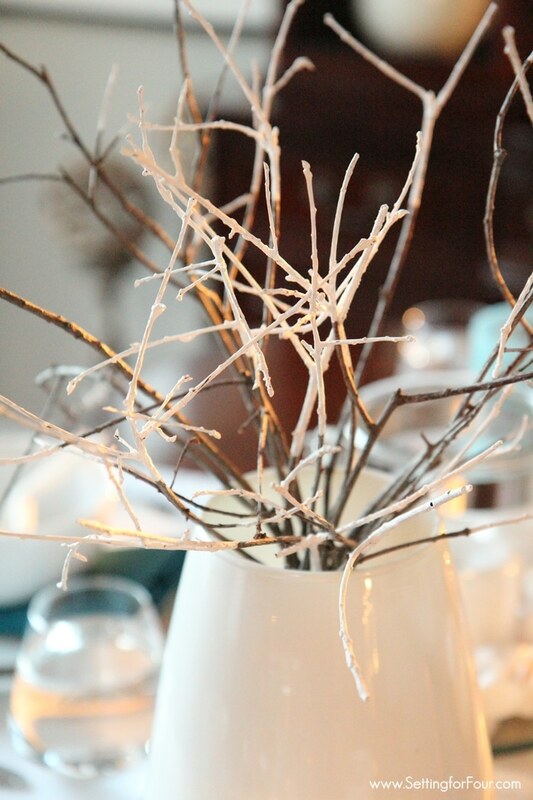 I made this easy summer centerpiece for our dining room table – some twigs from our back yard dipped in white paint and plopped in a glossy white vase…it reminds me of coral! 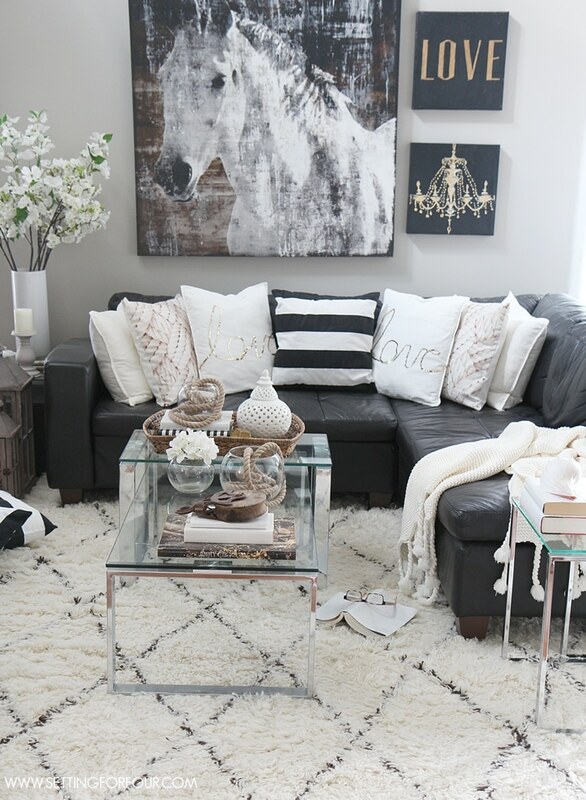 I added lots of grey white, cream and blue colored accents in our family room for the summer. 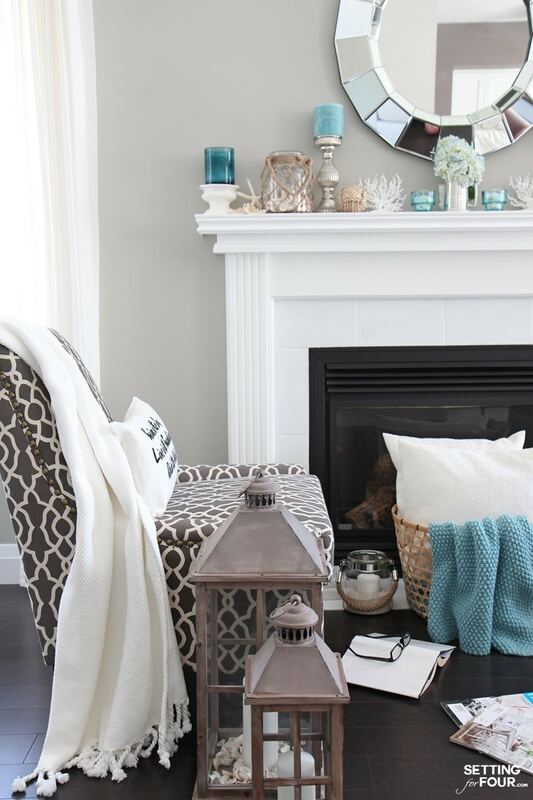 The faux Pottery Barn inspired white coral is a 10 minute DIY project! I made the watery blue Irish moss stitch blanket a million years ago during one of my hubby’s long deployments overseas. Making handmade things for our home has been a huge passion of mine forever and is a fun way to pass the time when my husband is deployed. 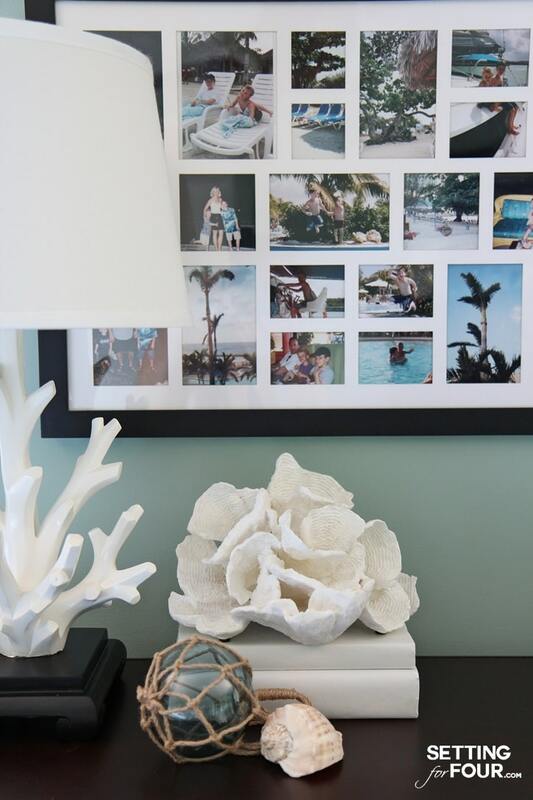 Here’s a dresser top vignette in our bedroom – a big collage of family pictures of our Caribbean trips. I LOVE these coral shaped lamps! 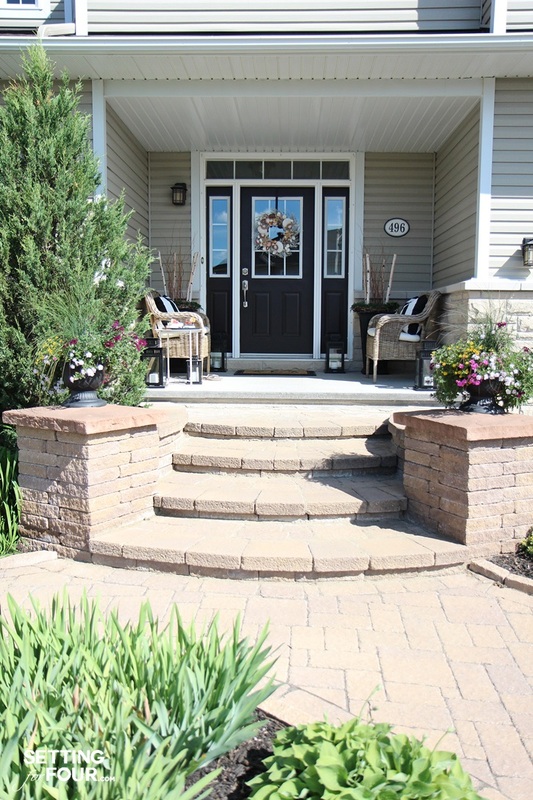 Now let’s take a look at our back yard, deck and patio! 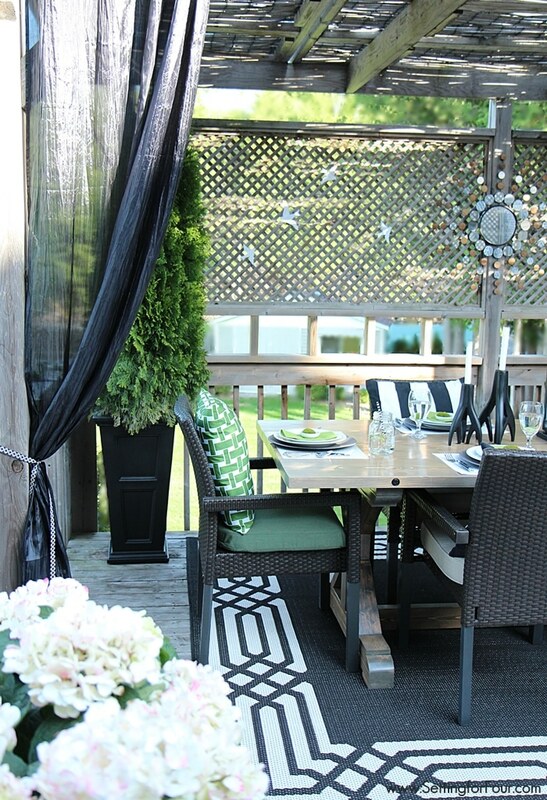 We love our gazebo dining area: I hung curtains, a mirror and planted big emerald cedars in black urns to make a cozy outdoor retreat for our family! All of this is weather proof and hangs out all summer in the rain and sun! Bringing the indoors outdoors is a great way to create a relaxing oasis. 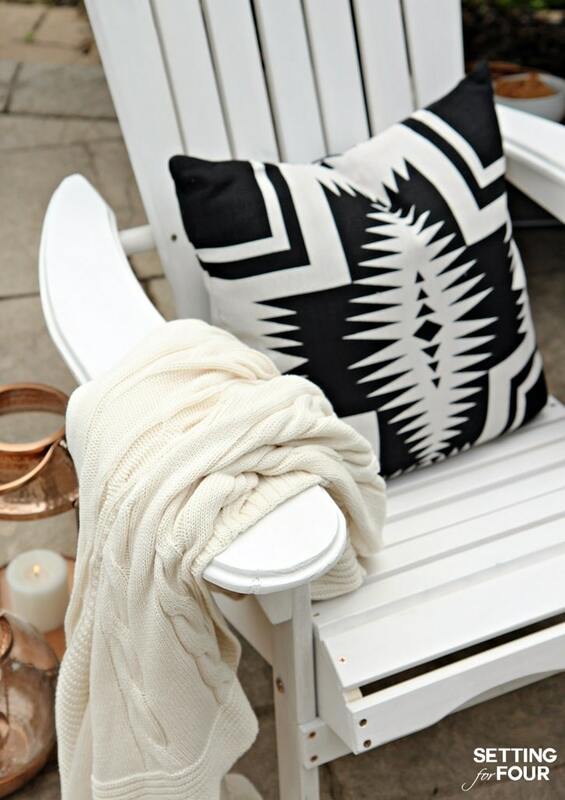 Adding this black and white outdoor area rug made all the difference! We even made this gorgeous DIY Restoration Inspired Table– we have lots of fun summer meals here! 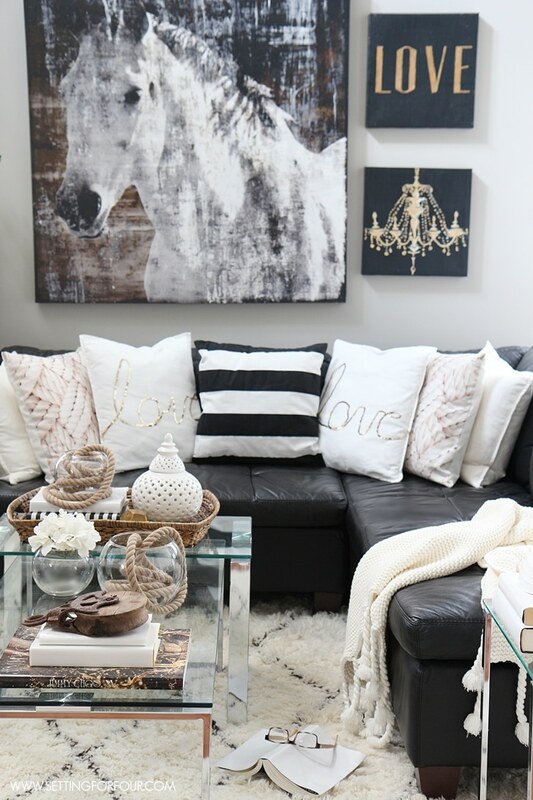 I love decorating with black and white mixed with metallics. 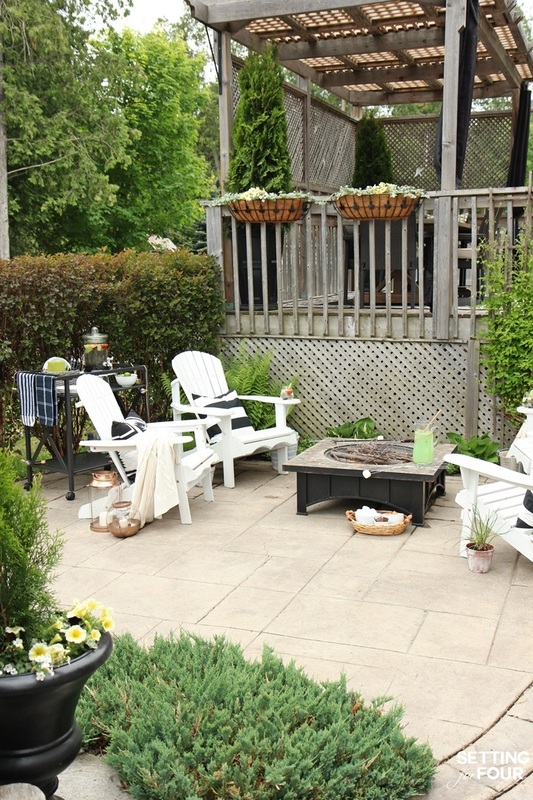 For our summer fire pit seating area I paired 4 white Adirondack chairs (we made those too!) with modern tribal print pillows and shimmery copper lanterns. This a view of our forested back yard patio area, landscaped gardens and fire pit….and our comfy gazebo dining area on the raised deck. This is where we end the tour….at our watery back yard refuge! 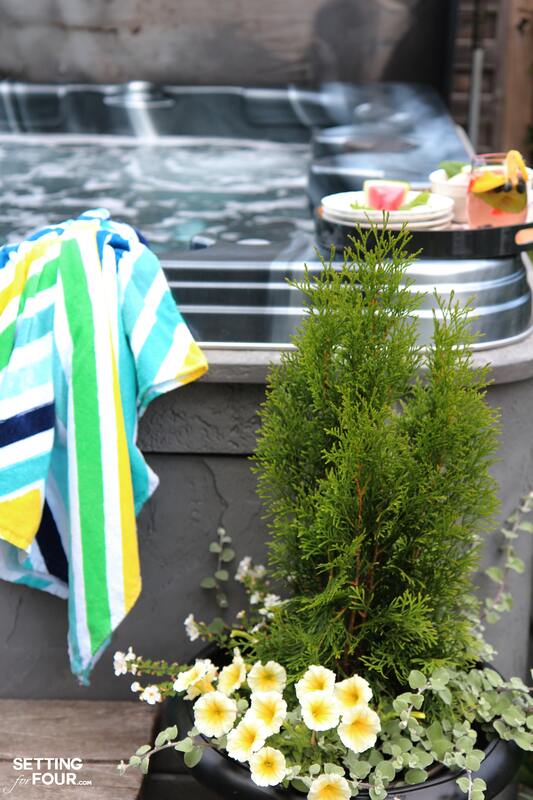 We hang out in our hot tub on weekends and summer evenings as much as possible. 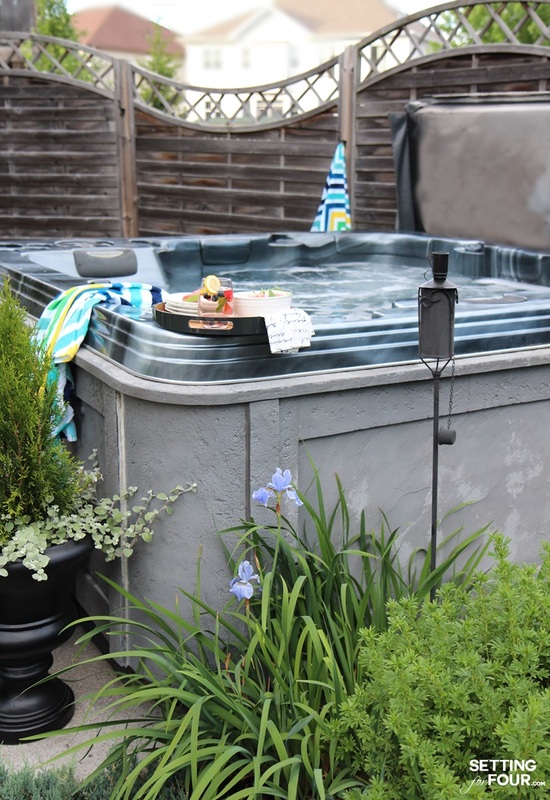 We hop in our hot tub all summer long, turning the heat off and cranking up the jets is a great way to spend the summer sipping on a bevvy. Come on over for a dip sometime! Although we don’t live near a body of water right now, I’m hoping finger’s crossed!!!! that our next military posting takes us back to water side living! 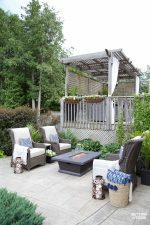 I hope you enjoyed my summer home and garden tour and found some new beach style decorating ideas for your home! Be sure to visit these 16 gorgeous waterside home tours to see homes from coast to coast spanning across North America to Aruba! I love all of your subtle beach touches Heather! Recently I found a buoy on our beach and it has this crusty rope attached with barnacles. My husband thought I was nuts in bringing it in to display….so I’m glad to see yours! Your home is lovely and you have proved that you don’t need to live waterside to have a gorgeous coastal vibe. 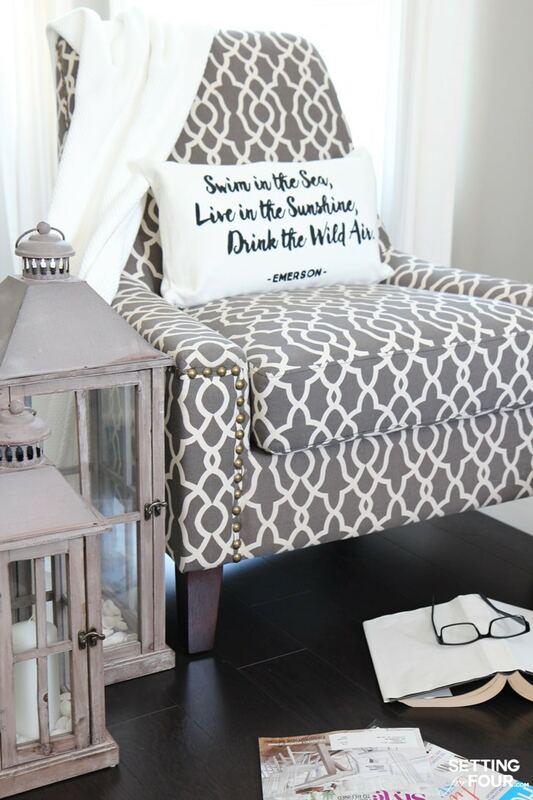 Elegant, comfortable, inviting……your love of the water shines through! Thank you for sharing! 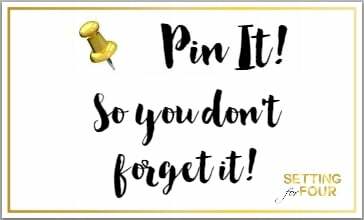 I so glad you joined in this home tour, you have such a beachy style and you fit right in.Your home reminds me of a home I used to rent by the beach for the summers in Hilton Head Island where we live by. If i did not read this post I would have thought you were right by the beach. 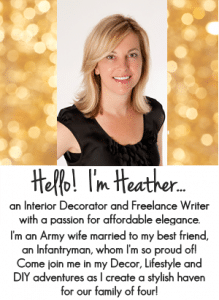 You have such a beautiful home Heather! I love the subtle coastal touches you have put throughout your home. One of the key things I love about coastal styles is the textures which you have down pat. Thanks for the inspiring tour! 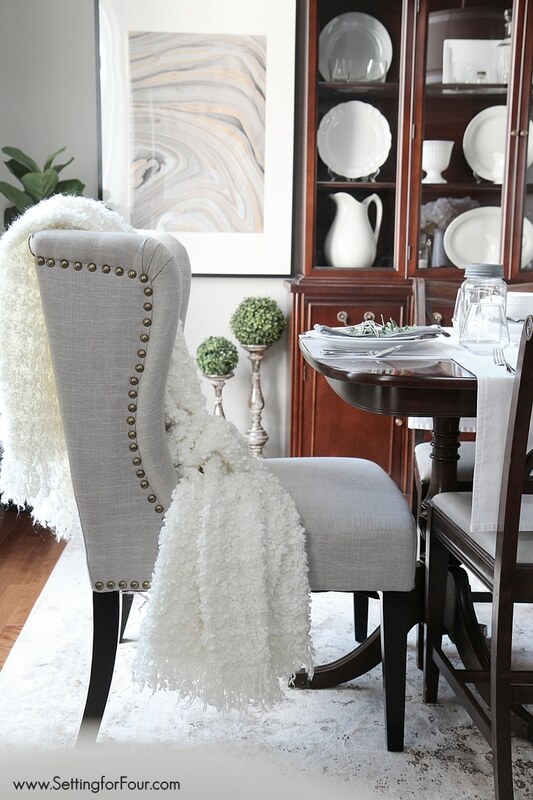 I love adding loads of texture to my spaces Nancy – it brings so much interest to a neutral palette! Thank you for your lovely compliments and happy summer! Beautiful tour Heather! I love the shell wreath! And how light and bright it is, the perfect spot to unwind. AND there’s a hot tub. Perfection. 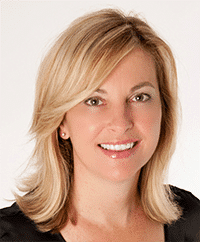 Thanks Karah – so glad you enjoyed my home tour! Hope you have a happy fun summer! Looooove it all! From your amazing entertainment center (popcorn included) to your rope decor. It’s all amazing. 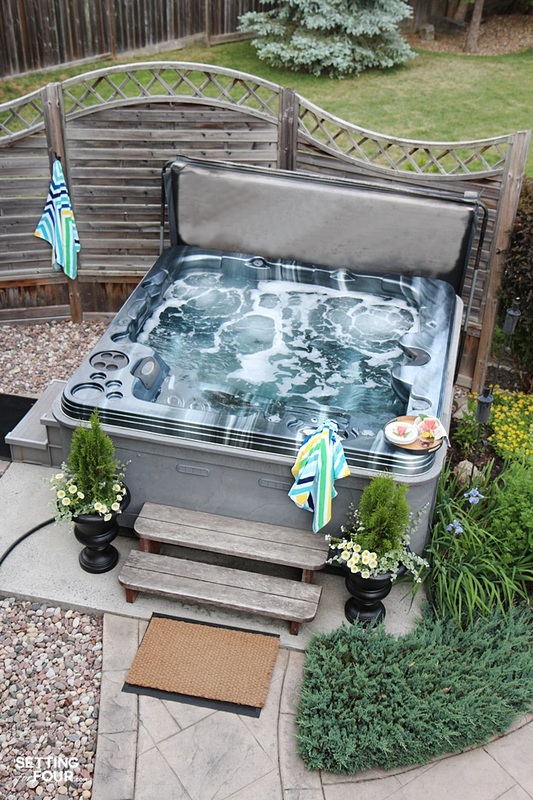 Oh and that hot tub? Ummm – I think I need one! LOL! This was a beautiful home tour. Thanks for sharing! 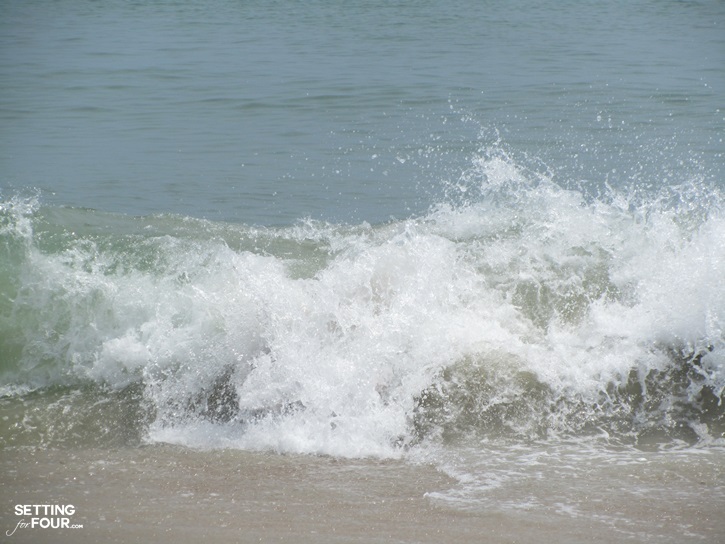 I love to read about your style and your love for the ocean and water. It gives me a little bit more into your personal taste. 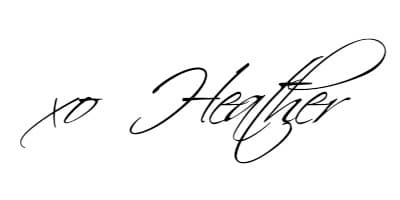 Thanks so much Heather. You are always someone that I follow style for. Thanks for inspiring me constantly. We lived in Va Beach for four years (I went to ODU for my Masters) !! Then moved to Emerald Isle, NC before we got stationed out here. 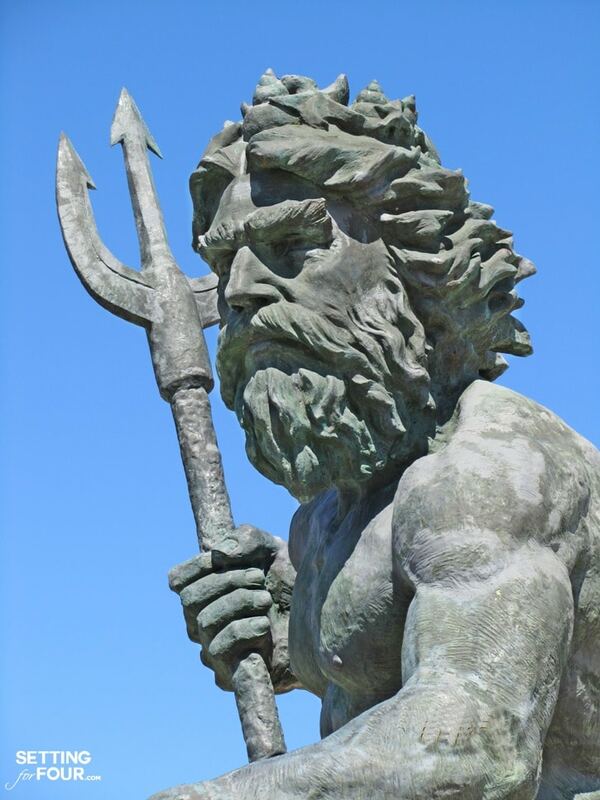 Love the East Coast and outer banks! Your photos and home are stunning. I’m so glad you were a part of this tour. Your love of “water” translates beautifully throughout. I’m so thrilled you enjoyed my home tour and thanks so so much for your compliments! 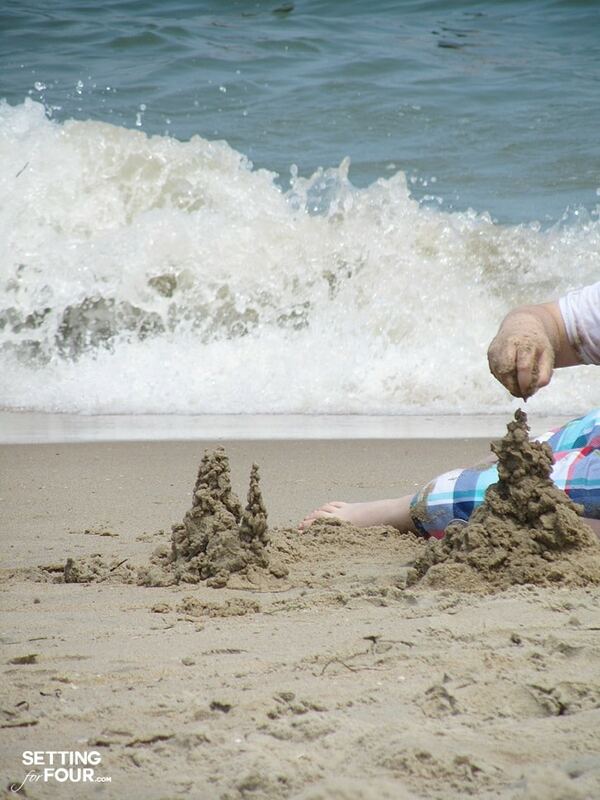 So wonderful to hear you have a connection to VA beach as well! Hoping you have a beautiful summer Kathy! I love this post! 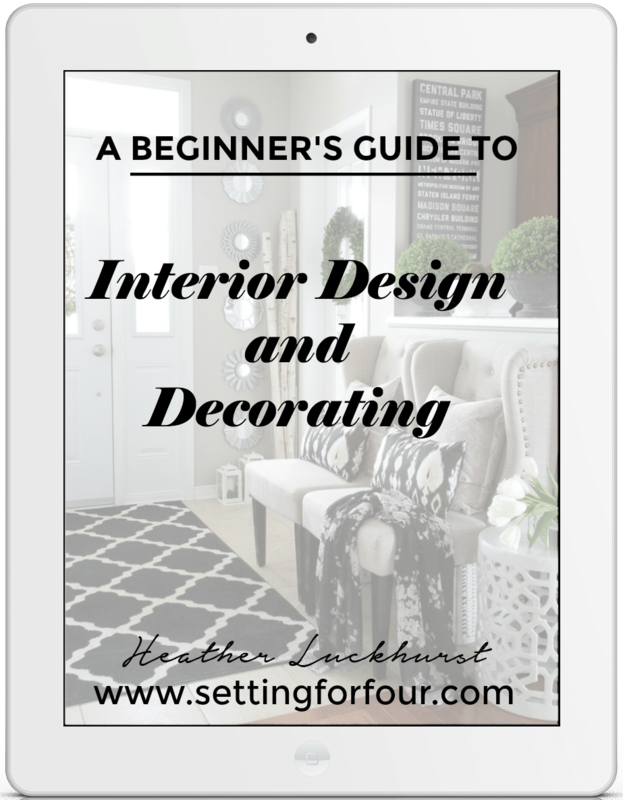 It was so fun and interesting to read – and, having grown up near water my whole life, I think I would still gravitate towards decorating in a coastal style even if I moved far away from it. Gorgeous tour, Heather!! Beautifully styled and photographed, as always!! How do I find out what colors you used to paint the outside of your home (main color, trim, and accent door)?? Hi Becky – I don’t know what our siding color is – it’s a taupe color with a hint of green – our door color is Sherwin Williams Irongate. I think I’m just realizing you lived in Va Beach for a while. I live in Chesapeake. It is a great place to live in the summer. Not been real happy this winter with this crazy weather. Love all your posts and Instagram.